I’m not afraid to admit that I hate cigars. A shocking, divisive, and opprobrious statement, if there ever was one, I’m sure. Perhaps I haven’t really ever experienced a good cigar, I don’t know, I also don’t really care. I’ve been in the presence of good cigars being smoked and my reaction to the stench was the same as my reaction was to being in the presence of bad cigars being smoked…I couldn’t get out of the room fast enough. Perhaps they’re like Cornnuts or Doritos, they smell horribly, horribly foul until you start eating them yourself. Doesn’t matter, that line of reasoning isn’t going to get me started puffing either. My personal preference aside, I do recognize that, like whisky, appreciating a good cigar can be a serious, nuanced pastime and that, like whisky, a good cigar can be a work of art, carefully crafted and enjoyed best with the respect it deserves…just not by me, sorry. In theory, I can even see how whisky and cigars would pair well together, and will even go so far as to say I like the idea of them together. In reality, though, for me, nothing could ruin the flavor of a good dram better than a palate killing mouthful of smoke. That and the whole stinking up a room thing. Still…that’s just me, all due respect to the cigar lovers out there, live and let live…and while you’re at it, check out this whisky. Once a year, Ian Macleod’s Chieftain’s range gathers a group of cigar and whisky experts at the Hotel du Vin in Glasgow and plies them with several samples to appraise. The favorite among the group becomes that year’s Cigar Malt. 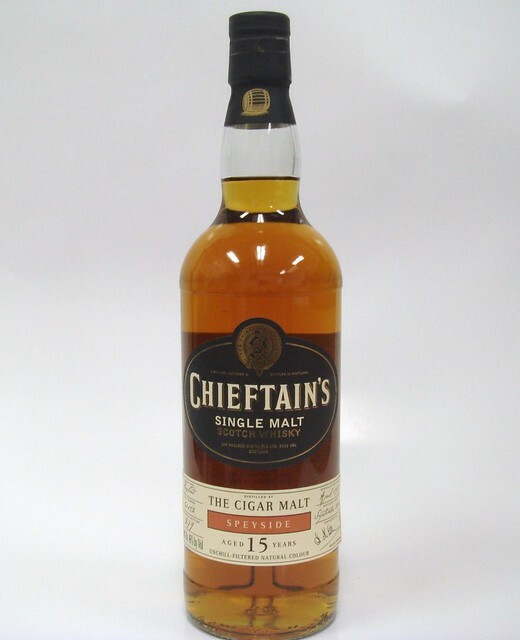 Cloaked in secrecy, Chieftain’s divulge neither the distillery nor the barrel type, instead letting the malt speak solely for itself. This years expression comes from a Speyside distillery and has been matured for 15 years. The Nose: A dark, winey, somewhat restrained nose with orange flavored chocolate, homemade butterscotch, and dry-ish red fruits – currents and blackberries. Creamy vanilla and cinnamon float over the top while lighter notes of polished oak and a faint herbaceous-ness swirl around below. The Palate: Lightly creamy mouthfeel. Honeyed to start as woody spice quickly grows dark and tannic like an over-oaked Pinot Noir. There are nice, malty, dark chocolate notes and more drying currents. Turns slightly vegetal towards the end with hints of cinnamon, clove and cardamom emerging. The Finish: Nice clove and leather with good fruity acidity. Thoughts: Though at times this struck me as restrained, it’s a really delicious malt. Rich chocolate and fruits with just enough herbal bitterness to balance. This is neither a big sherry bomb nor an essay on the merits of oak, just a crisp, tight, flavorful whisky, very Speyside-ish at times but also unique in its subtle power. I found this an excellent sipper without cigar, but I can see this cutting through the taste of smoke and complementing those earthy tobacco notes very well. 86! I think “Little Quarter Cask’s” hull breaches are beginning to effect your senses. I love this stuff. It deserves a 90 rating at the very least. I can’t wait for the sun to cross the yard arm and I can have more than a wee dram of this wonderful malt on a day, a month into spring, with the temp in mid thirties and with rain, snow,sleet and hail fighting it out for dominance outside my window. Ah, Wisconsin in the spring.